Sometimes it can feel like medical terminology is a language all of its own. There are so many specialized medical terms that it can be difficult to understand all the jargon used in the doctor's office or to easily recall these long, difficult words for class. Understanding medical suffix meanings can help you figure out the full meaning of a tricky term, whether you're talking to your doctor or studying for a test. Fortunately, it's possible to decode unfamiliar medical and scientific terms. Many are combinations of common Greek and Latin prefixes, root words and suffixes. Learning the most common parts of medical terms makes it easier to figure out what a word means when you put the pieces together. To allow you to understand more medical terms, it helps to certain medical suffix meanings. You won't be overwhelmed by the long words if you can readily identify parts of it. Many medical terms are made up with the same set of endings. This list of common medical suffixes will help you become more familiar with medical and scientific terms. When a medical suffix beginning with a consonant is added to a stem ending with a consonant, a vowel, usually -o-, is added as a connector, as in lymphocyte. When a medical suffix beginning with a vowel is added to a stem ending in a vowel, the stem's vowel is dropped, as in appendectomy. Understanding the basic meanings of medical suffixes will help you decipher what your medical practitioner or professor is saying. In general, the prefix or root word will refer to the body part in question, and the suffix refers to a procedure, condition, or disease of that body part. By putting these terms together, you can better comprehend a condition or treatment. You can learn more about Greek and Latin root words here. "Medical Suffix Meanings." YourDictionary, n.d. Web. 18 April 2019. <https://examples.yourdictionary.com/reference/examples/medical-suffix-meanings.html>. Sometimes it can feel like medical terminology is a language all of its own. There are so many specialized medical terms that it can be difficult to understand all the jargon used in the doctor's office or to easily recall these long, difficult words for class. 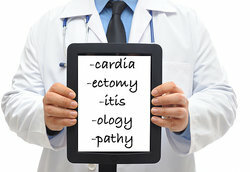 Understanding medical suffix meanings can help you figure out the full meaning of a tricky term, whether you’re talking to your doctor or studying for a test.Fortunately, it's possible to decode unfamiliar medical and scientific terms. Many are combinations of common Greek and Latin prefixes, root words and suffixes. Learning the most common parts of medical terms makes it easier to figure out what a word means when you put the pieces together.To allow you to understand more medical terms, it helps to certain medical suffix meanings. You won’t be overwhelmed by the long words if you can readily identify parts of it. Many medical terms are made up with the same set of endings. This list of common medical suffixes will help you become more familiar with medical and scientific terms.